A Life Lived Forever: A Life Lived "Forever"
With signature moves like the Warrior Splash, epic battles against Hulk Hogan, Sgt. Slaughter, Macho Man Randy Savage, and The Undertaker, and impassioned speeches that struck fear into his opponents and inspired warriors across the nation, the late Ultimate Warrior became one of the most revered figures in WWE history. Here, for the first time, the complete legend of The Ultimate Warrior is told in full, from his humble beginnings as a self-proclaimed “small, insecure kid who wasn’t into any sports” to his rise to WWE fame as the most powerful force in the universe. 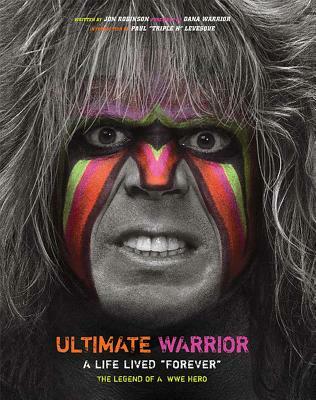 Through both action and candid photographs; personal ephemera, including original Warrior art and detailed journal entries; insider stories and exclusive interviews with WWE legends, and intimate accounts from the Warrior family, this unique biography brings the legacy of The Ultimate Warrior to life like never before. Relive the Warrior’s most intense matches and rivalries, and get to know the man behind the face paint in this one-of-a-kind volume. Filled with intense action and little-known details, Ultimate Warrior: A Life Lived Forever is a celebration of the Superstar who left an inimitable mark on WWE and redefined sports entertainment for generations. All WWE programming, talent names, images, likenesses, slogans, wrestling moves, trademarks, logos and copyrights are the exclusive property of WWE, Inc. and its subsidiaries. All other trademarks, logos and copyrights are the property of their respective owners. © 2015 WWE, Inc. All Rights Reserved. Jon Robinson is a sports and entertainment writer from San Francisco, California. His work has appeared in ESPN, Sports Illustrated, and IGN.com, and he is the author of five books, including Rumble Road, My Favorite Match, and The Attitude Era.